Down two from last year, this Cuban drink has felt the brunt of changing fashion and now feels like a vestige of the last decade. Yet it remains a true classic. Havana’s La Bodeguita is the place for a mouthful of mint and though never a top 50 bar, our Academy has thrown a few votes its way over the years. It makes its Mojitos with rum, lime juice, soda, brown cane sugar, fresh mint and ice. Up from 12, the Moscow Mule has seen an unlikely comeback in the past few years. It’s a crowd pleaser in just under a third of our 100 bars, with popularity seemingly springing up from the US. Clover Club, one of The World’s 50 Best Bars all-time achievers, sells vodka, lime, ginger and soda during happy hour, which keeps the less adventurous punters satisfied. Down from no.3 to no.8, the Sazerac remains a top 10 in a third of bars. Cure apparently makes the best in NOLA, birthplace of the drink. The Bonded Sazerac is EH Taylor rye whiskey, demerara syrup (2:1), two or three drops of Peychaud’s bitters, a splash of Nouvelle Orleans absinthe, lemon peel and dense ice. The Margarita is frozen at no.7 this year, though mostly not served frozen at the third of our bars that said it was a best seller. As Tommy’s was among the World’s 50 Best Bars this year, let’s drop by there for the recipe. The Tommy’s Margarita, by Julio Bermejo, is reposado 100% agave tequila, plus fresh lime juice and agave syrup. Up from 10 to six is the Whiskey Sour, a top 10 favourite of a third of our 100 polled bars, though only one said it was number one. That’s not too surprising as this is an everyman’s drink, hardly a house signature. The recipe is bourbon, lemon juice and a teaspoon of sugar. Egg white is optional, but anything to add interest seems worthwhile. 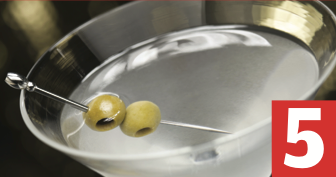 No.5 at the world’s best bars is the Dry Martini. In the UK, Duke’s is the AOC of this classic, but in light of Barcelona’s Dry Martini (a stalwart of The World’s 50 Best Bars) opening in London, we shall defer to Javier de la Muelas. His bar uses half and half gin to French vermouth, a dash of orange bitters, a squeeze of lemon rind and a green olive. If it’s a Martini for Muelas, drop the lemon. Up two places to fourth is the Daiquiri. In just under half the bars we polled, this was a top classic and in 10% it was their no.1 yesteryear mix. We could ask La Floridita in Havana for the recipe but in memory of Sasha Petraske – a two-time champion of 50Best – we shall use his. That’s fresh lime juice, 1:1 simple syrup and Plantation Three Star white rum for punch. chilled coupe and garnished with brandied cherries. The Negroni was a top 10 best-selling classic in more than two-thirds of our 100 bars, and again second to the Old Fashioned. It is the most popular gin cocktail out there. Don’t mess with the recipe, says received wisdom, including Gaz Regan. It’s a third, a third, a third of Campari, sweet vermouth and gin. And for Count Negroni’s sake, stirred, not shaken. 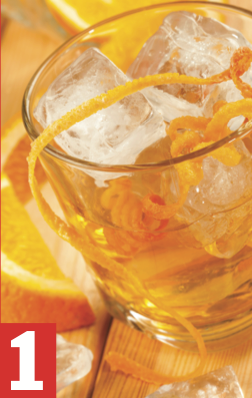 As last year, the Old Fashioned is anything but at the world’s best bars. Three-quarters of bars polled said it was among their top 10 best-selling classics and a quarter said it was their number one. Our bars opt for bourbon, but The World’s 50 Best Bars host David Wondrich suggests rye would probably have been the likely choice way back when. He goes with: 1 sugar cube – wetted with three dashes of Angostura Bitters and a little soda – crushed, stirred with a large ice cube and two ounces of rye.